We’d love your help. Let us know what’s wrong with this preview of Field of Valor by Matthew Betley. With the full resources of the Justice Department, Intelligence Community, and the military (not to mention presidential pardons pre-signed) Set in the aftermath of Betley’s “machine-gun pace” (Booklist) Oath of Honor and the discovery of a deadly global conspiracy, the president requests Logan West to form a covert task force with the mission to dismantle a nameless enemy. To ask other readers questions about Field of Valor, please sign up. Logan West and his team are after the usual mastermind out to foment a war between America and China. This time, the father of one of the Chinese agents killed by West in the last book is out to kill the team. He's high up in the Chinese intelligence community, and has a legion of minions to help. One word comes to mind when writing a review for Matthew Betley’s Field of Valor... WOW!!! Just WOW. If you’ve been following his books since his debut in 2016 with Overwatch, then the amazing follow up Oath of Honor, you would know why I’m saying that. This man can write a book that will speak to you. I had no idea how he was going to write a better thriller than the emotional rollercoaster Oath of Honor is, but somehow Matthew exceeded all my expectations. On the very first page, on the very f One word comes to mind when writing a review for Matthew Betley’s Field of Valor... WOW!!! Just WOW. If you’ve been following his books since his debut in 2016 with Overwatch, then the amazing follow up Oath of Honor, you would know why I’m saying that. This man can write a book that will speak to you. I had no idea how he was going to write a better thriller than the emotional rollercoaster Oath of Honor is, but somehow Matthew exceeded all my expectations. On the very first page, on the very first line the bullets are flying and from there it barely lets up long enough for you to absorb what just occurred and moves on to another action scene which comes up as a total surprise. Like, WOW (again) I didn’t see that coming. Side note: If you’ve had the absolute pleasure of serving in my beloved United States Marine Corps. This book along with Overwatch and Oath of Honor is written for you. It will speak to you in so many ways. There are many talented authors out there, but those who have served often throw small, often overlooked dialogue that pin points their time in the service. Small things that come to mind is Brad Taylor’s Pike Logan series with call signs, or Joshua Hood’s Mason Kane, when he talks about the canvas cots we sleep on that are such a pain to put together. With Matthew Betley, his time in the USMC is clearly evident with so much sarcasm thrown in that is very specific to Marines. 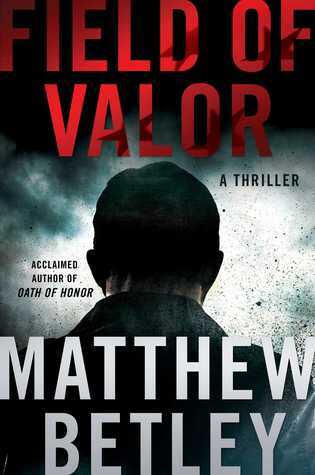 With Field of Valor Matthew Betley has somehow figured out how to fit an IMAX 3D Hollywood Summer Blockbuster onto the pages of a novel (which is probably why his books have been optioned by Thunder Road Films!). Right off the bat I’ll let it be known that I think this will go down as one of 2018s best thrillers. This is a novel of pure adrenaline and thrills that delivers something on every page. Its the ideal summer read which makes its release right before Memorial Day an act of sheer brilliance. For fans of Betley’s two previous novels: The Barry Award nominated Overwatch and 2017s brilliant follow up Oath of Honor, you’re in for a treat! For readers new to Betley you’ll find that Field of Valor works as a tremendous stand alone thriller which will ultimately make you want to go back and read book 1 and 2. A quick spoiler free over view of what you’ll see. Field of Valor centers around a secret cabal hellbent on creating a rogue republic and it is willing to do whatever it takes to achieve their goal. It’s up to Logan West and his team to stop them before the United States is changed forever. With Field of Valor, Matthew Betley has not only crafted his best thriller yet but has as I’ve said already produced what will easily be one of 2018s best thrillers. Betley who has quickly become one of the most unique and original voices in the genre, has upped the ante with his third novel. Field of Valor, is a thriller of such breakneck speed and intensity that it might be impossible for you to put it down. Betley’s trademark action and humor are in full display and he has once again proved he is not an author who merely writes cookie cutter thrillers. One of the things I appreciate most about Betley’s writing is that he is willing to make each novel feel so unique but at the same time crafts such an interesting overall arc between each book. In Overwatch, Betley was able to give us an origin story that felt fresh and original. With Oath of Honor, it was a globe trotting adventure worthy of the best Mission Impossible and Bond films. With Field of Valor, he has mixes it up again and has given us a novel that plays out over only a few days time. This creates such a sense of tension, that it forces readers into the same sense of anxiety that the characters face. Each of Betley’s book provides the readers with a new vibe and for that he is to be commended. One thing that every Betley book has is action! That never changes and it’s what he is the best at. Pound for pound no one delivers more action in a novel than Betley. He doesn’t create just a fight scene, he create grand action set pieces. They are big, they are insane and they are written in such a way that you feel your seeing the action unfold before you not reading or listening to it. It’s safe to say you get more action in a Betley book that you would if you added up 2 to 3 books worth of action from other authors. I just love Logan West. The best special agent. Glad someone reviewed a previous book and let me know what a great character Logan West is. Ohio author Matthew Betley grew up in Cincinnati, attended St. Xavier High School and Miami University in Oxford, Ohio, where he earned a B.A. in psychology and minors in political science and sociology. He also spent the first semester of senior year investigating felony murder cases as an intern investigator in Washington, D.C., for the Public Defender's Office. After graduation, he worked in corporate America for five years in Cincinnati before joining the Marine Corps in 1999. Matt spent ten years as a Marine officer and was trained as a scout sniper platoon commander, an infantry officer, and a ground intelligence officer. His experiences include deployments to Djibouti after 9/11, and Fallujah, Iraq, prior to the surge, both in staff officer support billets. Of important note Matt is a recovering alcoholic with nearly eight years of sobriety. He credits the Marine Corps with providing a foundation in discipline and personal accountability for his desire to initially seek help. Matt is open and direct about it and has spoken in front of large groups of people with one clear message - if he can get sober, so can anyone. He credits his recovery with providing the authenticity for Logan West's struggle with his inner demons. With a bio such as this it is no wonder Matt has become such an important writer in the genre of military and terrorist thrillers. He knows the military, the legal system, and the impact of personal demons. But that does not always accompany a fine writing style: in Matt’s case the tools and the manner in which they are conveyed are married well. If by chance you have recently picked up a novel advertised as a “thriller,” only to set it down in disappointment a third of the way through, let me recommend FIELD OF VALOR to you. Author Matthew Betley has earned the right to talk the talk because he has walked the walk, having spent 10 years as a Marine officer in deployments in Djibouti and Iraq. Some of this background informs the narrative directly, in particular during a flashback vignette. But in general, the book is shot through --- li If by chance you have recently picked up a novel advertised as a “thriller,” only to set it down in disappointment a third of the way through, let me recommend FIELD OF VALOR to you. Author Matthew Betley has earned the right to talk the talk because he has walked the walk, having spent 10 years as a Marine officer in deployments in Djibouti and Iraq. Some of this background informs the narrative directly, in particular during a flashback vignette. But in general, the book is shot through --- literally --- with Betley’s world vision, paid for with dear coin earned through experience. FIELD OF VALOR is the third in Betley’s series of thrillers featuring Logan West. Those who are familiar with OVERWATCH and OATH OF HONOR, the first two installments, need no further introduction. However, for the uninitiated, let me briefly state that Logan, a marine voluntarily separated from active service, is the tip of the spear known as Ares, a black-ops task force commissioned by the President and assigned to take down a large, multiple-tentacled group known as the Organization. Started by a billionaire, known as the Founder, with a troubled past and the best of intentions, the Organization --- as a result of its independent and complicated structure --- has slipped loose from his control and is now orchestrating multiple false flag attacks against the United States with the intent of creating instability between the US and China. Betley is aware that the Organization’s membership runs deep into the US government; what he doesn’t know is how high it truly goes. So it is that FIELD OF VALOR opens with the members of Ares under attack from...well, you’re just going to have to read the first few pages because I am not going to spoil it for you. Know that the story kicks off with a vignette taking place about 48 hours after the book actually begins --- call it a flash-forward --- and that it sets the tone for all that follows while taking over half of the novel to wondrously catch up with itself. It is full of car chases, ambushes, explosions, hand-to-hand combat, double-crosses, and a trail of dead bodies, most of them (though not all) belonging to the bad guys, who are being dispatched by Logan, his loyal and reliable second-in-command John Quick, and an additional assortment of memorable characters with the right stuff and attitude. Logan is not one to trouble himself with political correctness, given that he functions in the real and immediate world, and the result is a refreshing change from what is all too often foisted upon the public as entertainment. This is not to say that things go smoothly for Ares in general or Logan in particular. While the book is complete in itself, there is a bit of mopping up left to do by the time the story concludes, and your favorite character may not make it to the final pages, as in real life. Once you begin reading, however, you will set all else aside to reach the end. What we have here is non-stop action. The series has been optioned for video and is a natural for cross-marketing between the books and the digital. If you have seen “Strike Back,” the addictive Cinemax series, or the beautifully realized John Woo movie franchise, you’ll get a hint of what FIELD OF VALOR is like. Strongly recommended, especially for those who prefer to read their fiction without blinders. Betley can definitely write an action-packed thriller. The third in his Logan West series is filled with gunfire, explosions, stabbings, car chases, profanity, betrayal, and dead bodies. A list of who's who in The Organization, a shadow group attempting to provide stability through illegal and lethal means, is given to Logan and the subset of The Organization that has decided chaos is better wants it back. The names on the list go higher than Logan and Team Ares can imagine, and it will take all Betley can definitely write an action-packed thriller. The third in his Logan West series is filled with gunfire, explosions, stabbings, car chases, profanity, betrayal, and dead bodies. A list of who's who in The Organization, a shadow group attempting to provide stability through illegal and lethal means, is given to Logan and the subset of The Organization that has decided chaos is better wants it back. The names on the list go higher than Logan and Team Ares can imagine, and it will take all their skill to survive. My only real quibble with Betley's work is some of his writing choices. This may improve with time, but as someone who reads heavily in this genre, these tendencies grate. We know every time there is an explosion because the text says, "B-B-Boom!" Sound effects aren't necessary. Just say the RPG hit the target and the resulting explosion blew everything to smithereens. Also, Logan is a badass. I get it. There is no need to describe how terrifying he looks to every single bad guy. Some of the dialogue is clunky. Only continued writing (and great editors) will fix that, and I feel certain that future novels will show that improvement. A rogue republic is operating inside the government. The group, known as the Organization, is made of a select group of powerful people. They make things happen, get things done. Sometimes the end does not always justify the means. More and more t I just finished reading the third book in the Logan West series. 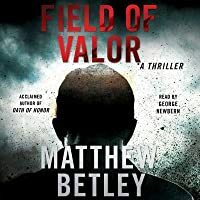 Matthew Betley’s Field of Valor is comparable to the first two in the series. Non-stop adrenaline. Witty banter. A clever plot. Twists and turns, and more twists, and even more turns . . .
What an amazing story. The Author has done a wonderful job in the detail and background of the characters, and Logan West is the ultimate fighting machine. There are plenty of action scenes, and I quite enjoyed the plot. It just never lets up, which is one of the things I love about Matthew Betley’s books. He certainly knows how to entertain. Lau Han wanted revenge for his son’s death, more than anything else in the world, and he was sure Logan West was the man responsible. Logan spent years ove What an amazing story. The Author has done a wonderful job in the detail and background of the characters, and Logan West is the ultimate fighting machine. There are plenty of action scenes, and I quite enjoyed the plot. It just never lets up, which is one of the things I love about Matthew Betley’s books. He certainly knows how to entertain. Lau Han wanted revenge for his son’s death, more than anything else in the world, and he was sure Logan West was the man responsible. Logan spent years overseas in the military, and he normally knew who is enemy was. Now the President has given him the mammoth task of finding a different enemy, and they are going to be a lot harder to find and defeat. Luckily Logan has an incredible team of amazing operators, that are very deadly in their own right. However, Logan is scared of losing one of them, as he is still haunted by the death of his friend Mike Benson. Logan manages to get his hands on the list that has every member’s name on it, belonging to the rouge group that they are hunting down. He’s just got to work out who he can trust, and stay alive at the same time. A very good story from start to finish. If you enjoy Action Thrillers then you will love this book. Matthew Betley exploded onto the scene with Overwatch which introduced the world to Logan West. In Oath of Honor, West and his team reached new heights and now in Field of Valor Betley has proven that he has what it takes to stand alongside all the greats in the field and his character Logan West can stand shoulder to shoulder with Jack Reacher and Mitch Rapp. Lock those three in a room and I wouldn’t care to wager which one walks out. In Field of Valor West is leading a covert task force sanctio Matthew Betley exploded onto the scene with Overwatch which introduced the world to Logan West. In Oath of Honor, West and his team reached new heights and now in Field of Valor Betley has proven that he has what it takes to stand alongside all the greats in the field and his character Logan West can stand shoulder to shoulder with Jack Reacher and Mitch Rapp. Lock those three in a room and I wouldn’t care to wager which one walks out. In Field of Valor West is leading a covert task force sanctioned by the President to take down a group whose aim is to pit China and the US against each other, leading to a world and a government that is shaped more to their liking. Once again, the action leaps off the page, literally from the opening words. Betley writes high-octane action as well as anyone and the wise-cracking pair of Logan West and John Quick are a blast to watch. Cole and Amira, the other two members of the team, first introduced in the previous book are back for more action as well. Betley has a knack for quickly sketching out characters that make them instantly relatable. He did it in the previous book when introducing Cole and Amira and he does it here as well with Special Agent Austin Chang of the Secret Service. In just a few pages, he lets you get to know Chang and then drops him in the middle of an intense firefight. Not only are you invested in the action, you are invested in Chang and whether or not he will make it out in one piece. This kind of attention to what in other hands might be a throwaway character are one of the things that set Betley apart. West and his team follow clues that take them from a Space Center in Virginia to a private residence/fortress on the Chesapeake Bay and into the heart of his own government. Throw in some flashbacks to West and Quick’s time in Iraq where they are first introduced to some of the other characters that pop up and you have the stage set for some jaw-dropping action sequences. Betley can write a scene that will leave you gasping for air and convinced you can spell the gunsmoke in the air. Logan West is a larger-than-life figure who draws both fear and admiration. “The man fell to the earth, looking up at the looming figure of Logan West descending toward him like a mythological god of death and destruction.” That is Logan West in a nutshell. This is a fantastic series and Field of Valor will rank as one of the best thrillers of the year. If you haven’t picked up these books yet, do it now. Highly recommended. I was fortunate to receive a copy of this book from the publisher. This book brings to an end the "Organization" a well financed international cabal of men bent on the destabilization of the U.S. government. Logan West and John Quick and the rest of their team battle rouge government Secret Service agents, military traitors and mercenaries in order to accomplish their mission. The President gives them a free hand to do what ever it takes to take them all down, which they do with bloody efficiency. It's and action packed read with a few surprises thrown in. Lord have mercy, but Mr. Bentley has outdone himself again. The intensity and forward movement of his plot has again kept me totally committed to finishing this book before undertaking what I needed to do in life at bay until I finished the last page. But as before, he didn't really FINISH the story. He seems to have just finished this episode. I sincerely hope that he's well on his way toward finishing the next episode. the 3rd novel by Matthew Betley in the Logan West series. Logan and John Quick along side Cole and Amira face their biggest threat yet. Buckle up and enjoy the ride, because Betley doesn't let off the gas in this action packed adventure following on the heels of last year's Oath Of Honor, (my favorite book of 2017). This is the 3rd book in the series that I have read and this is one didn't do it for me. I suspect it was the beginning: lots of action, then goes back in time. Guess I am too linear to be jumping around on the calendar. I am surprised that I finished the book. The hero seems to be a blend of Superman and The Hulk. Three stars. Another fantastic adventure from Matthew Betley. The book starts off with an intense action scene and doesn't let off right up to the jaw dropping finale leaving readers eagerly awaiting the next adventures of Logan West and co. Betley is quickly launching himself into the rarefied air of Vince Flynn and Brad Thor as the best thriller writers going around. Not my usual book, I like mysteries but usually don't go for military type books. This book was good. It was a slow read for me with the details of guns and such that I'm not familiar with and also I had the flu while reading this so could only read for short times. If you want action and lots of it, this is the book for you. It makes me thinks of some of Matthew Reilly's books. Action right from the first page and does not stop until the last page. If you have read the previous 2 books in this series you will not be let down. Too much technical talk about equipment they were using. The setting was familiar as having been to some of them in the book. It helps to be able visualize the story line. A good read for people who enjoy conspiracies but a little to basic. A tick less than the previous 2 excellent books in the series, this one suffers from too much spoken exposition and some hackneyed dialogue. A rush that ultimately powers over those speed bumps. An exhausting running gun battle from the first page (seriously - the first words are ‘crack. crack’ for bullet impacts) to almost the last. Very confusing opening even though I’ve read his previous stuff. Another excellent book by Matthew Betley. Non stop action from beginning to end. The formation of Aires and the members of the team, make this series extremely exciting. I can’t wait until the next book comes out. I finally found an interview that Matthew Betley did where he talks about already being 100 pages in to book 4 and throws in something about books 5 and 6. YES! Even though the ending somewhat set up room for continuation, you never know, so that made my day. What can I say about the story? It was full of adventure, action, intrigue and great character development. If this is a genre that you enjoy - Brad Thor, Brad Taylor, Ben Coes, Mark Greaney, Leo Maloney - then Logan West is a protagonist to add to your list. I really like reading series. This was as good as my favorites. Good story line, great characters. I hope there's a 4th book. Matthew Betley grew up in Cincinnati, Ohio, which he considers home after his family moved there from New Jersey, where he was born and which also explains his affinity for the New York Yankees. He attended St. Xavier High School and then Miami University in Oxford, Ohio, where he graduated with a B.A. in psychology and minors in political science and sociology. He also spent the first semester of Matthew Betley grew up in Cincinnati, Ohio, which he considers home after his family moved there from New Jersey, where he was born and which also explains his affinity for the New York Yankees. He attended St. Xavier High School and then Miami University in Oxford, Ohio, where he graduated with a B.A. in psychology and minors in political science and sociology. He also spent the first semester of senior year investigating felony murder cases as an intern investigator in Washington, D.C., for the Public Defender’s Office, a formative experience that provided countless stories that could fill the pages of a non-fiction book. Upon graduation, he worked in corporate America for five years in Cincinnati before joining the Marine Corps in 1999. Finally, and most importantly, Matt is a recovering alcoholic with nearly seven years of sobriety. He credits the Marine Corps with providing a foundation in discipline and personal accountability for his desire to initially seek help. Matt is open and direct about it and has spoken in front of large groups of people with one clear message – if he can get sober, so can anyone. He credits his recovery with providing the authenticity for Logan West’s struggle with his inner demons.